Faithful Citizens of The State of Columbia! The Blinders are less than a month from releasing their debut album. Each day they cover new grounds and by September 21st the world should know the power of their music. This is your duty as a Citizen to assist them in the conquest for our glorious homeland. Pre-order the record, call your local radio station unit and your local news publisher. Talk to your friends and advise them carefully to follow the same instructions. Your faith and co-operation will be rewarded. This humble blog brings you coverage from the front lines and a State approved message. The Blinders will appear at Leeds and Reading Festivals this weekend. But before they hit the stage – they have gracefully answered our questions. So read this interview, spread the word and don`t forget to eat your meat. Fans and music press reached a consensus describing you as “must see band” and “one of most original acts in recent years”. Would you like to introduce yourselves to Indieterria readers? 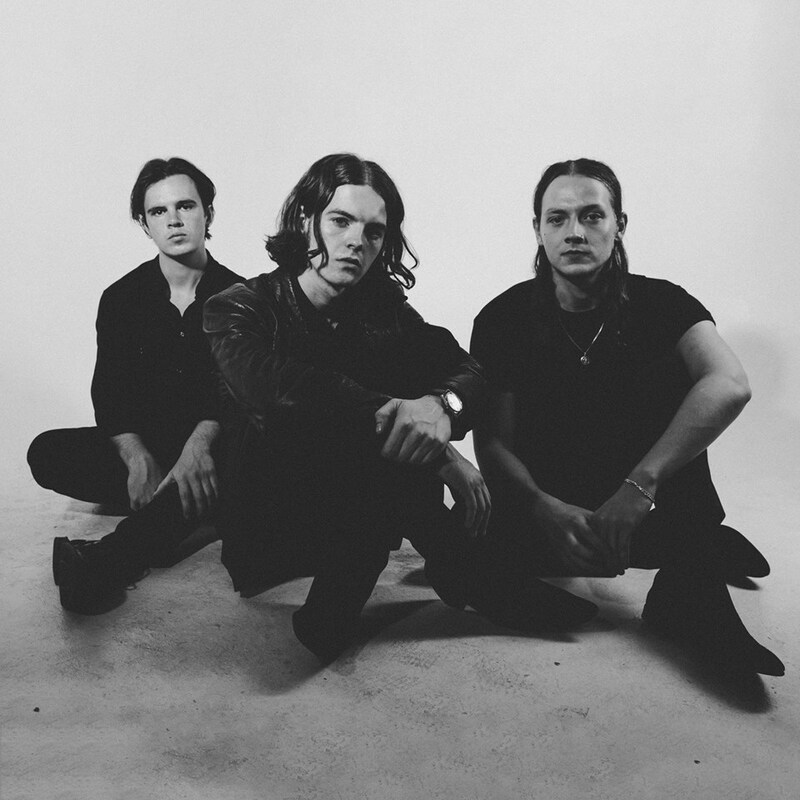 The Blinders: Hello Indieterria, individually we are Thomas Haywood, Charlie McGough and Matthew Neale, collectively we are known as the Manchester based band, The Blinders. You often describe yourselves as “Johnny Dream and Codeine Scene”. It almost feels like there are two distinctive bands involved. So, while we do the introductions, would you like to tell us who are the members of Codeine Scene? Do they have names? Can you elaborate how did you create the stage personas and their meaning? 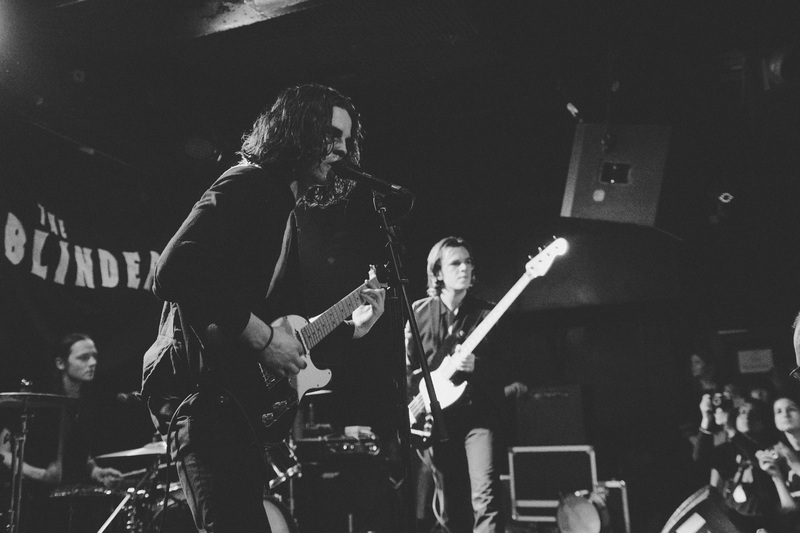 The Blinders: There are no specific members as of such. The Codeine Scene was a title banded about by ourselves when we came to name the band. We dismissed the idea and went with ‘The Blinders’ in its place (what fools we were). Johnny Dream plays a small narrative role on stage dressed in warpaint. However, the whole Johnny Dream and The Codeine Scene thing is a vessel we use in our heads to take on egos outside of our own in order to perform The Blinders’ music to its fullest intentions, all the while allowing us to detach ourselves from the on-stage personas. In short, it keeps us sane and allows us to remain grounded. Why The Blinders? Are you fans of certain drama on BBC 2? The Blinders: We are fans of the show. When we came to play our first gig, we were without a name so went with it. We didn’t really see it sticking, but here we are talking to you. You grew up in Doncaster but relocated to Manchester. Is moving to a bigger city beneficial for starting artists or is the competition for gigs and recognition not worth the effort? The Blinders: Both were incredibly important places for us in the beginning of our lives as a band. We wouldn’t be where we are without coming to Manchester and playing its venues whilst friends from Doncaster would travel in busloads to continue on supporting us. This seemed to make a statement in a place that can be cliquey at times but were lucky enough to get in with the right people. In terms of bigger cities being beneficial for starting artists, that’s undoubtedly true because the contacts and resources you need exist in these really quite creative and liberal hubs. It is hard to categorize your music. The Beatles, Police, Black Sabbath, Sonic Youth, Paul Weller, The Jam, Joy Division, Manics, The Doors and Arctic Monkeys were all mentioned as possible inspirations. If you were to review your own art, which musical heritage would you subscribe to? The Blinders: We don’t subscribe to a specific heritage. We obviously lean on certain bands or certain sounds, but it would be ludicrous to pigeon hole yourself as a ‘punk’ band. How could you while there are so many avenues to explore and doors to open in the world of music. We learnt how to write music like any other modern artist in the past 60 years, by having a hunger to listen to all music and interpret it in your own way. There are many pop/cultural, political and historical references in your lyrics. “Ramona Flowers” is a character from a series of graphic stories by Bryan Lee O’Malley, “Brave New World” shares its title with dystopian novel by English author Aldous Huxley, “The ballad of Winston Smith” is an obvious reference to “1984” and “Swine” comes with the hypnotic chorus “There is no hope” that reminds us of the fated scene in “Terminator2 : Judgment Day”. Your admiration for Jack Kerouac is also widely observed. You are first band since Manic Street Preachers who put their interest art and literature as a centre point of their music. Is it planned or does it naturally come out during the writing process? The Blinders: It’s certainly not a conscience thing, perhaps we simply write by immediate influence or inspiration. This can be anything from a piece of literature to walking past the same homeless person every day and their story being impressed upon you. We like our lyrics to have a narrative, which is probably why novels and film seem so natural to draw influence from. Call us lazy. Response to your music is incredible and it reads like a litany: you have been played on BBC 6 Music by several DJs, recorded a session for Steve Lamacq at legendary Maida Vale, Radio X`s John Kennedy is a fan, you have been on BBC Introducing, Louder Than War featured you in print, NME and MusicGlue offered rave reviews, influential zines such as Northern Exposure and Some Might Say champion you, you have been part of influential This Feeling circuit and your single “Gotta Get Through” stayed on top of charts on Amazing Radio for weeks. You have achieved more in two years than most bands in their life-time. Where do you plan to go from here? The Blinders: To the top, Johnny! To the Toppermost of the Poppermost! You have recently signed to a label (Modern Sky UK). That’s a major step for any artist. Does it come with losing your creative freedom or does it give more fire power to the band? The Blinders: There’s clearly a balancing act. At the end of the day without signing such a deal we wouldn’t be talking to you about our debut album. We’d still be scrapping around trying get Brave New World recorded. We were given the chance and we took, and we can’t more grateful for that. We are now in a situation where we can pursue art and writing for a living, so you can’t complain. Your debut LP “Columbia” will come out on 21st September. So far three singles have been made available from the record: “Gotta Get Through”, “L`Etat C`est Moi” and a new version of “Brave New World”. We can`t help but ask. Is Columbia a concept album? 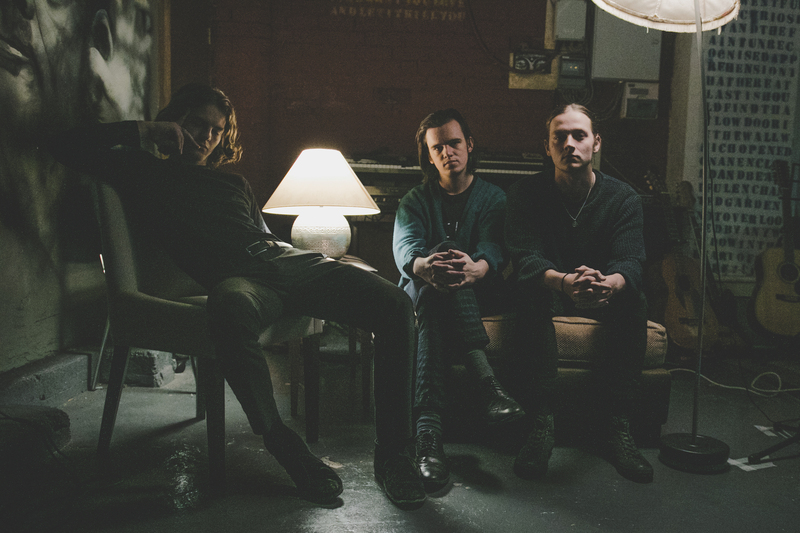 The Blinders: It can be a concept album for the people who want it to be. There are narratives and theme to be drawn from the album, however a lot of people will enjoy it as just 12 songs to be enjoyed in their own right. It also means different things for us all individually, we just want people to take what they will. If people simply listen to it, that is enough for us. We know you try to leave room for interpretation for listeners but, in your eyes, if Columbia was a real place: would it be a state or a town or alternative universe? Would it be more closer to Oceania with its poverty and lack of resources or would it be a highly advanced society (similar to what is shown on Fear Factory`s trilogy Demanfacture – Obsolete- Digimortal)? 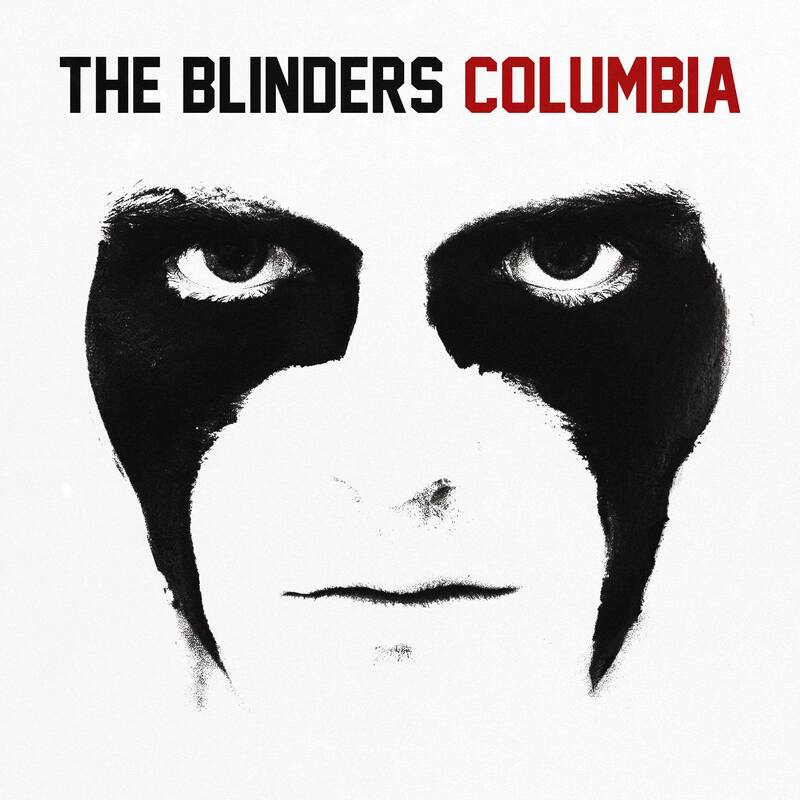 The Blinders: Columbia is drawn from our own reality. There was never any intention on creating our own dystopian world, it created itself from the worst parts of society we live in today. We used the dystopian narrative and language alongside our interpretation of what is going around us today. So Columbia would probably look a lot like what the UK or America does today. And a question that must follow: is Johnny Dream a friend or a foe? Can we see him more of a real protagonist like Winston Smith or Edgecrusher or is it just an idea? The Blinders: Neither, he doesn’t exist. One of our favourite songs is “L’état, C’est Moi”. The title can be translated as “I am the state” and is commonly attributed to Louis XIV of France. He established the French absolute monarchy and made France the main political power in Europe in his time. Surprisingly, the song feels very accurate in the current political climate as well. Tell us more about this song and its message. The Blinders: The song was written around the very phrase that came out of his supposed mouth. It was something we’d picked up in a book somewhere and it stuck with us. As you say, it seems relevant, especially to a world in which frankly insane politicians and other insufferable individuals appear to be grabbing power and moving society in a direction in a way which seems to show a complete disregard for the people. Once the album is out, you will embark on a 22- date headlining tour around the country. That will be the biggest tour to date. Are there any venues or towns that you are looking forward to visit? The Blinders: Manchester feels most like home when we play, so that will hopefully be a highlight. We’re not really sure what to expect, we’re just looking forward to getting back on the road. “Columbia” is being promoted by cryptic advertisements in the press, made out of fragments of lyrics. What a great idea! What else can we expect? Secret shows? New single or a video? Are you able to reveal any secrets? The Blinders: We are working on something here and there, but our lips are currently sealed. At the end of August you will headline BBC stage at Reading/Leeds festivals. What can we expect from your set. And since the show is sold out, will there be a chance to see/hear your performance afterwards? The Blinders: We’re presuming that a song or two are going to be filmed, so that will be there for your viewing pleasure. There is a certain darkness in your music. In “Berlin Wall” you ask if voice of a sole person still matters. In one of your older songs “Swine”, you sing “I need not to be, a man in the street”. It is a brazen declaration of intent to escape the routine and grey existence of the common man. Yet, many of the most important events of the 20th century were started by the everyman, those invisible individuals who found themselves in extraordinary circumstances. We can mention the Tankman, a still unidentified man who stood in the way of tanks coming to suppress the Tiananmen Square protests of 1989 in China, Ryszard Siwiec (Poland) and Jan Palach (Czech Republic) who set themselves on fire in protest against police brutality against the Prague Spring, or August Landmesser who refused to perform the Nazi salute after becoming engaged to Jewish woman, Irma Eckler. Their sacrifices contributed to massive social mobilizations and in effect bringing down regimes and corrupted governments. Maybe each one of us is really capable of changing the world? The Blinders: As we mentioned before, many of our songs are drawn from the worst parts of our society. Combined with our existential perspective of whether any of this even matters anymore, naturally there is a darkness. In terms of our capabilities as individuals, we can commit incredibly powerful acts. Those acts are even more powerful in unison but that’s the problem we have. How can we stand together while those in power seek to divide us? In May you have released a short film/video to “L’etat C`est Moi” that was a collaboration between Tom and Sam Crowston. It ends with the mysterious “to be continued”. Are you working on part deux? Will we learn what happened to the messenger and what exactly he was given to deliver? The Blinders: We had a lot of fun creating that piece, and it’s something we intend to return to. When that will be is another question. Let’s say The Blinders were offered to take up teaching residency at the university for the duration of one term. What subject would you like to teach: creative writing, English literature or political science? Is there something really important to you that you’d like your students to remember? The Blinders: It would undoubtedly be something on the subject of History, Politics or Sociology. We each have a tutor or lecturer which we were greatly inspired by whilst we attended university/sixth form. We’d like to spark the same inspiration in our hypothetical students. Let us ask you about the swine masks that are a recurring element in your videos. Your technical crew members were also known to wear them during live shows. Who or what are they? Columbia’s secret service or symbol of corrupted regimes? The Blinders: A lot of features in our work tends to start as something trivial, with little meaning attached. We then allow it to manifest into its own ‘thing’. This happened with the masked men, Johnny Dream and our vision of Columbia. It’s a very fun way to work. One last question. We have already established that you are designed for rock and roll greatness, but if you weren’t in a band, what careers would you pursue? The Blinders: We’d probably all be butchers or something. We will be doing a proper review of Columbia once it comes out. Till then we hope you enjoyed our profile and the interview with the band. Big, big thank you to Caffy St Luce (A&R extraordinaire and our PR goddess) and Paul Fassam (the manager super hero) for all their help and assistance, the band for answering the litany of questions and their patience and Modern Sky for everything else. This broadcast has been created for the glory and prosperity of The State of Columbia. This entry was posted in Indieterria and tagged alternative music, blog, blogger, blogging, British music, Codeine Scene, Columbia, discover new music, Doncaster, guitar music, independent music, indie, indie band, indie music, Indie release, indie scene, Indieterria, interview, Johnny Dream, Journalism, live music, Manchester, Modern Sky, music artist, music blog, music blogger, music fan, music interview, Music journalism, music lover, Music Review, music scene, music writer, new music alert, pop culture, pop music fan, The Blinders, writer. Bookmark the permalink.